This morning I finally got confirmation that Conor Oberst will, in fact, be performing tonight at the Casbah with the Felice Brothers. Conor has four scheduled dates in California, so apparently tonight will be the warm-up show at the Casbah. I don't know if he'll be playing a full set, or if he'll be opening or closing the show, but for a $14 show, I'd say it's gonna be pretty special regardless. Conor was last in San Diego for the Monsters of Folk tour. 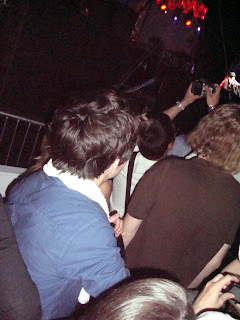 This photo is of the back of his head as I stood behind him at Coachella 2009 after he performed...I think he was as enthralled with Leonard Cohen as anyone in the crowd that night.